Church ministries need to include small groups, not just large corporate gatherings, to increase potential for fellowship, participation, and meeting of needs. Perhaps you have a lot of needs or struggles in your life. You need someone to minister and speak into your life. Small groups, which are supposed to provide safe environments for sharing, seem like a good place to unload … right? To that I would need to answer both yes and no. Small groups should be a place where you can open up and honestly share about your hardships. Yet, the word “group” suggests that it is intended to be about more than one person. A small group ministry provides one of the best places for a church to live out body life to its fullest. Click on image to enlarge in Pinterest & repin. 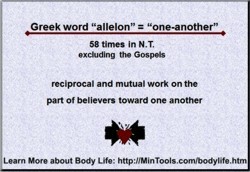 For God to use the same word, allelon, over and over highlights His intent for our life together as believers to be mutual or reciprocal, not unidirectional. 1) You are not the only one in the group with needs and struggles. 2) A small group is not a support group and even if it was a support group, the above, number one, still applies. 3) When group members share their struggles, it should be for the purpose of engaging in fellowship, not to “dump” on others. 4) Guard against setting expectations that others meet your needs. God is the ultimate source of comfort, peace, wisdom, and “everything we need for life and godliness” (2 Pet. 1:3), not people. God will use people, but you must never expect them to be your all in all. 5) Look for opportunities to minister to other group members rather than coming solely to have them minister to you. True healing and growth happen when we live within God’s intent. Sowing into someone else’s life has a way of putting our own needs into perspective. I’ve been to small groups where the leader opened our time for sharing and praying for one another and the time focused on one person and his/her needs. While that may be appropriate at times, if it is always happening, especially if it is with the same person, the group is being hijacked. Of almost any setting in the church where God’s design for mutual, reciprocal ministry one toward the other can happen, it is in a small group. If attention almost always goes unidirectional toward that one person, what you have is co-dependence rather than the interdependence. Small group facilitators, or leaders, need to be trained in group dynamics to be prepared for possible takeovers and know how to redirect the focus before it is too late. In addition, the purpose of small group ministry should always be kept before the group. This could be through teaching on God’s design for interdependence and the one another passages but also through modeling it. You might need to communicate guidelines for being an “allelon” group on occasion, especially when you have newcomers. Intentionally structure sharing and praying times to open the doors of opportunity for everyone to actively participate. Work toward building an “allelon” culture within the group. When that happens, group members will so value this core quality that they too will work toward the prevention of a hijack. For example, when someone shows signs of a takeover, a member of the group might volunteer to meet one-on-one after group time rather than leaving it up to the group leader to determine how to handle it. If the small group has been hijacked you need to rescue it before irreparable harm comes to it such as the purpose for small group ministry getting lost and other members becoming frustrated, disillusioned, and possibly stop coming. The rescue attempt should always be to protect everyone involved, not to violently take down the hijacker which invitably could lead to the person feeling embarrassed or rejected and possibly leaving the group. To be sure, as in physical rescues, as much as you try to protect everyone, it does not always end well. You cannot control the person’s reactions. Yet, you must be able to stand before God and say that you made “every effort to do what leads to peace and to mutual edification” (Rom. 14:19; also see Eph. 4:3, Heb. 12:14). You must always “speak the truth with love” (Eph. 4:15) applying both grace and truth. From the start I had included a page of resources on TrainBibleTeachers.com about leading discussions but I didn’t have a page specifically on small groups. This teacher training resource is about training teachers, not small group leaders. But, I recently got to thinking about how much teaching can potentially occur in a small group ministry and decided to add a page of resources specifically on small groups. Ministry Tools Resource Center views small groups as a great place for shepherding people. Teaching, of course, is part of shepherding. There are many resources out there on small groups. The page on TrainBibleTeachers.com about small groups includes even more resources than you will find on the MinTools.com site. But, how well are we training small group leaders? Part of the training process should include providing the tools group facilitators need to lead an effective group. The ReGroup: Training Groups to Be Groups DVD Curriculum suggests that not only must leaders be trained but also the small groups themselves. This curriculum helps the small group leaders do that. What are you doing to train small group leaders? How encompassing is your support?